Bidspirit auction | Withdrawn. 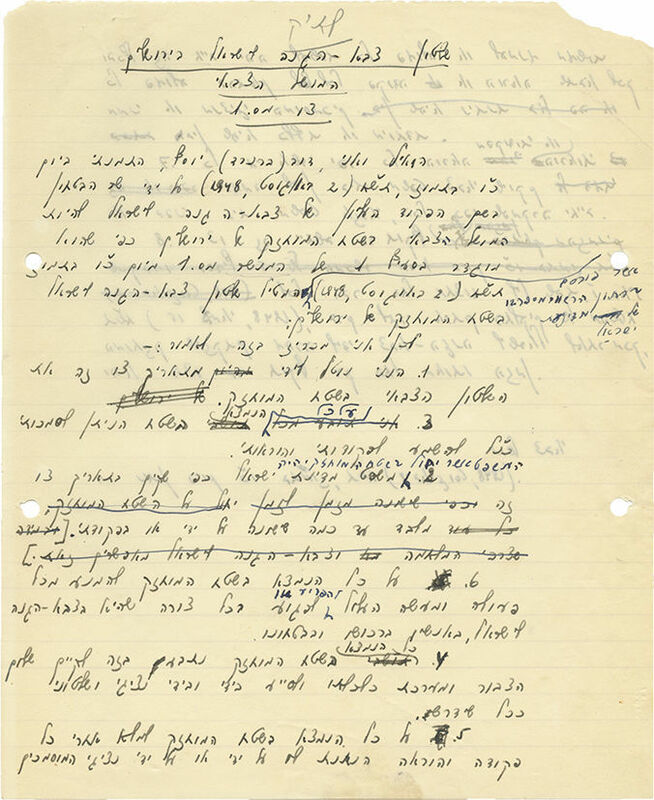 "Decrees, Orders and Notices"
Approximately 125 drafts, written by hand, typewritten or written on galley proofs, for decrees issued by Dov Yosef as governor of Jerusalem during the Israeli War of Independence. Jerusalem, [1948-1949]. Hebrew (one item in English). The drafts in this collection are from various stages of editing (some are written on notes and some are typewritten and stapled as booklets), and they record the work done by Yosef during the war, the procedure of wording laws, and life in besieged Jerusalem. Among them: thirteen drafts for Order no. 1, announcing that Dov Yosef is the Governor and that Jerusalem and its inhabitants are under his command; eleven drafts to Order no. 2, that includes the "held area" in Jerusalem in the zone of the State of Israel; dozens of galley proofs of the compilation "Decrees, orders and notices", with comments and additions handwritten by Yosef; drafts for decrees concerning annexation of neighborhoods occupied by IDF, abandoned property, supervision of food supply, limitations on residential rent, curfew on neighborhoods on the border, cancellation of claims against the administration and its representatives, and other subjects. Dov (Bernard) Yosef (1899-1980), jurist and minister in Israeli governments, born in Montreal. On August 2, 1948 he was appointed military governor of Jerusalem and was in charge of its civil, economic and military matters. Yosef became governor when the city was besieged, with its destiny pending, and saw himself being responsible for supporting the citizens and strengthening Jerusalem's status as the capital of Israel. In his book "Kirya Ne'emana…1948" (Schocken, 1960), Yosef told about his feelings when he undertook this mission: "Most of my life I sat in Jerusalem… at that moment I felt the wings of providence, and I was praying for success in this crucial position imposed on me" (Hebrew). Size and condition vary. Good overall condition. Minor blemishes. Filing holes. Tears and open tears at margins of some leaves (mostly small).